When the cooler temps trickle in it makes me crave all the comfort food which to me means I want to make all the soups and strews! 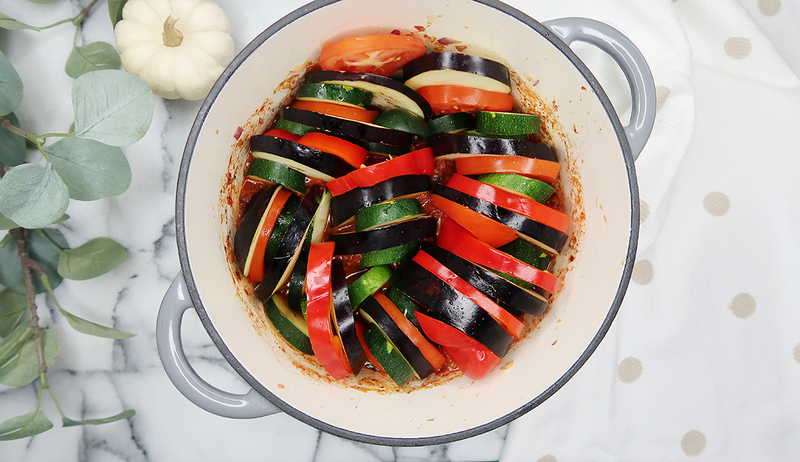 Ratatouille is a great dish for those cold nights, and not just for vegetarians/vegans either. 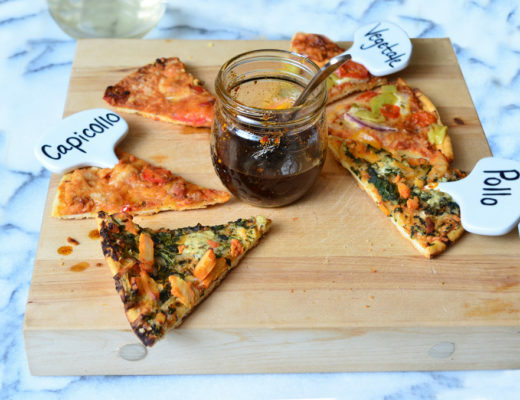 With so many different textures settled into a savory tomato sauce this fiber rich meal is not only delicious it’s all sure to fill you up too. At least once a week I like to make something meat free, and not for any particular reason other than I feel like it’s a good idea for both my body, and the environment. 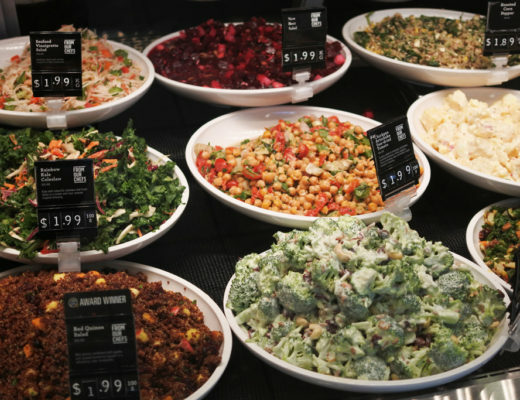 Opting for meals that are meat free also typically means LOTS of veggies which to me is just always a good idea. 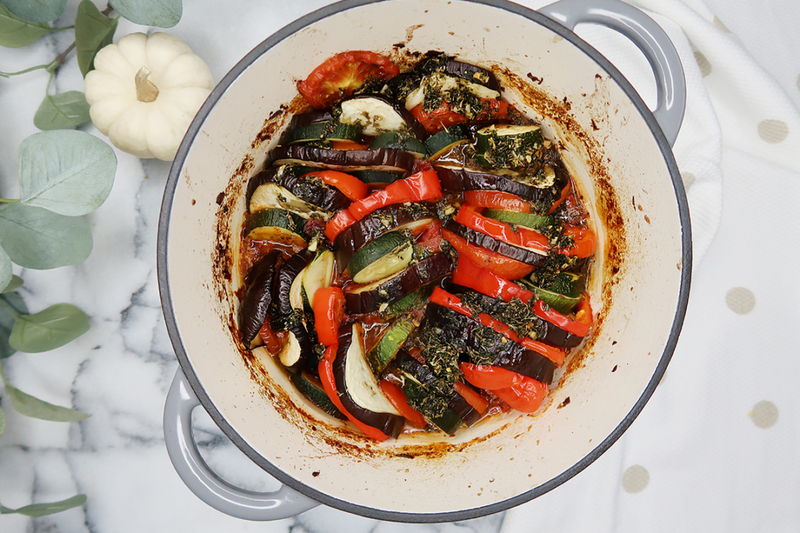 What I love about Ratatouille is that it’s a great starting place for any meal, you could absolutely enjoy it as is, with some warm crusty bread, or combine it with something else you already have on the go like a roast chicken or a pasta. 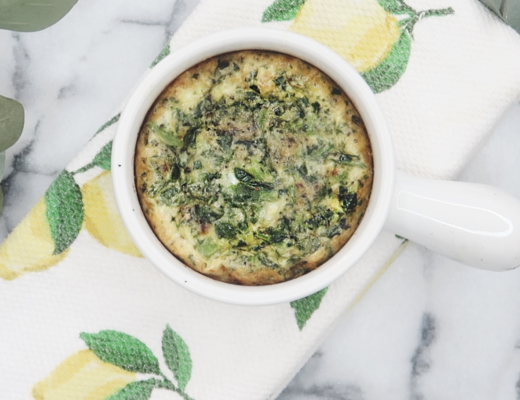 With so many veggies packed into one dish the possibilities are endless. Ratatouille also SUPER easy to make (believe it or not this was my first time and I filmed it) using my Dutch Oven from President’s Choice it was a one pot dish which means less mess (yahoo). I didn’t really create the most beautiful spiral, but I was actually pretty proud of myself considering I was just winging it. It was kind of tough because the zucchinis were so much smaller than the eggplants, so in some cases I doubled the zucchinis when next to the eggplant. In hindsight, I should have purchased the smaller variety of eggplants, but again remember I was winging it. You’ll see what I mean in the video, but honestly it still tasted amazing, so whatevs. Don’t you just love the colors?? It’s so pretty I can’t wait to make this again near the holidays. Heat pan or dutch oven over medium heat. Combine: onion and red pepper to soften. Add tomatoes, and gently break them apart to create a more rustic sauce texture. You could also use your hands to squeeze and break them apart the oils from your hands are actually great for this, but I always make a mess, so I didn’t since I was recording. Add spices: basil, garlic, onion powder and a pinch of chilli flakes + salt and pepper to taste. Reduce the sauce down to combine (3-4 minutes then reduce to low). Once your sauce is combined, and it’s no longer steaming (i.e burning your hands off) you can begin to assemble your veggies in a spiral pattern. I was winging it, so my best advice is to just try to switch it up with the veggies and gauge what you’re running out of lol I used what I had left over which was a lot of zucchini to fill in the blanks as necessary. Before tossing into the oven combine: olive oil, garlic and parsley and thyme and drizzle over the top of the veggies. BAKE at 375 covered for 40-45 minutes, and removed the cover for the last 15-20 minutes. Stay tuned for more fun videos, and let me know if you have any requests.